If you have a panel interview coming up, well, I want to talk to you about it and how you can ace it. All right. So, first, I want to define what a panel interview is just in case you guys don’t know. It’s when you go into an interview and there are several other interviewers in the room, usually maybe three to five different interviewers in the room, and you are in there and you’re interviewing. That is a panel interview. Panel interview is going to consist of a manager, probably hiring manager, maybe even that person’s manager and then a couple of their subordinates; that’s usually it. Sometimes, human resources will sit in on this interview, but it just depends. So, anyway, anywhere from three to five people is a panel. Now, what happens is a lot of jobseekers go into this interview format and they’re so nervous because there are so many other people in there and they feel so much pressure they don’t know what to do, they don’t know what to say, they freeze up. They get they get a brain freeze because they feel they’re under so much pressure to talk about themselves that they just can’t do it. I mean, it’s not really a natural setting for a person to go in and be bombarded by five other people in suits. That’s just not normal; we don’t do that. I mean, in our own company we go into a board meeting or something like that, but those are people that we know. This is five other people that you don’t know. For the first time and you’re going to go in and you just expect to be yourself and talk about things and be relaxed and comfortable? No, it’s tense. It’s a tense situation when you want that job and you have to talk to all these other people. Well, don’t worry my friend because I’m going to teach you how to navigate the panel interview so that you can come out on top. Now, I’ll tell you right off the bat, the reason that you are freezing up in a panel interview is because you’re not prepared with what you’re going to say. You think you’re prepared. You think you’re ready to talk about your past experiences, but you haven’t prepared yourself and that’s the biggest mistake everybody makes. They walk into this interview thinking, “Well, they’re going to ask me questions about my experience. So, I’ll just go ahead and I’ll just talk about whatever comes to mind”. No, it doesn’t work that way. You have to think about, ahead of time, what you’re going to talk about. And the best way to get prepared and to talk about all of your experiences is to think about them ahead of time. You see, we store all of our work experiences in our long term memory. Our long term memory very haphazardly stores things. It takes it might take five pieces of information from one project and store it in just all kinds of crazy places. It’s a mess. If you’re if you’re a programmer or you know anything about databases, it would be like an unindexed brain; that’s what your long term memory is. It’s just a hole where all kinds of information is and you think you’re going to walk into an interview and just be able to selectively pull out all these pieces of information from your long term memory and talk about it in a very calm manner and explain all the things that you did and what went right and what didn’t go right? No, it doesn’t work that way. I mean, maybe you could do that if you were sitting down having coffee with a friend, but now you’re sitting down with five people in suits who are not your friends. That kind of raises the bar a little bit; makes you a little bit more nervous, makes the whole thought process kind of go a little slower like molasses in the winter. It’s just the brain just isn’t moving. So, what you must do is you need to rewrite all of your experiences ahead of time. So, you need to go through it. You’ve got to get a sheet of paper, you’ve got to get a pen and you’ve got to go through and you’ve got to write out what you did in step 1, step 2, step 3, step 4; break it down into four phases. On this project; in phase 1, this is what we did. Phase 2, this what we did. Start filling in the blanks. As you go through this once, and let’s say you re-remember a project from a year ago and you start filling in all those blanks, more information is going to come to you and you’d be like, “Oh, wait a minute. We did this too. Oh, wait, and we did this” and you’ll keep filling in the blanks. This might take a couple hours, but it’s worth it. Believe me; it’s worth it. So, here’s what’s happening; as you’re remembering everything, you’re organizing your thoughts in your long term memory. You’re transferring those over into your short term memory. Now, your short term memory is totally different. It’s very well indexed. It’s quick, it’s fast and it can talk about anything at any given time and it can shift gears very, very quickly. Women are very good at using their short term memory to talk about things; just rattle, rattle, boom, boom, boom. One, two, three. That’s exactly the position that you want to be in because it’s in the short term memory. It doesn’t matter if you’re nervous anymore; your short term memory is going to work through that. It’s going to pull you through that. So, those five suits out there that are staring at you and they’re asking you questions, because you have committed all of your experiences, recommitted them to your short term memory, you’re going to be in a position to talk about all those experiences very succinctly, very quickly, and you’re going to be able to pick out exactly what points they want to hear about at any given time. First do this for one project, and get used to the process, and then go pick two or three other projects that you plan to talk about that are related to what they are looking for in the job description. Don’t re-index or re-remember things that aren’t important. Re-remember the things that are. Because if you have 15-20 years of experience, how are you going to go into an interview and just decompress 20 years of experience in 60 minutes? You can’t; it’s impossible. You can’t do it and you can’t go in there thinking that you’re just going to randomly pull out things that they want to hear. Nobody is that good. You can’t do it. You just can’t do it. You have to think about this stuff ahead of time; think about those experiences. Another option here is to pretend you’re going to teach something. Like let’s say you’re applying for a web developer position. Maybe you want to create like a mock training class for yourself that’s going to teach people web development basics. What this is going to do is it’s going to reinforce that in your mind. You see, when you can teach something, you are in a much stronger position to talk about it very succinctly, very fluidly, with a lot with a lot of continuity. So, there’s two options for you; rewrite all of your projects out; the ones that are relevant to what you are looking for the job or the job description; or create just a mock training program; just create a simple framework. And that’s going to force you to re-remember all of your past experiences so that you can explain them to somebody else in an organized manner. That will help you talk fluidly in the interview so you’re not nervous. The next thing you want to do is when they ask you a question, start answering the question by looking that person in the eye and then shift over to the next person and the next person and the next person so that you’re including the panel in your answer so that each person feels that you are connecting with them because you look them in the eye. And if it’s a long answer, maybe you’ll go around the room a couple of times, but if it’s a shorter answer, you’ll start off with the person who asked the question, then to the next person, the next person, the next person and then you wrap up your answer with the person who asked it in the first place. That’s how you bring your answer full circle and you include the panel in your answer and you make them feel like you’re talking to them too right where you are. Now, what can happen is in a panel interview, because there’s five people on that panel, you might get some rapid fire questions. So, like one person asked a question, and as soon as you’re done answering it, there’s another person; he asks a question. As soon as you’re done answering that, there’s another one. So, you get this rapid fire succession of questioning. What that does is that burns you out. It’s kind of inconsiderate their part. I don’t think they’re doing it to be inconsiderate, they’re just doing it to keep the pace and the interview going, but that burns you out; that fries your brain. So, what you have to do sometimes is to slow down the pace of that questioning and there’s a couple things you can do. One, you can just grab a bottle of water, have some water sitting there, and just take a little sip of water after you finish answering the question. And what that’s going to do is that’s going to create a natural pause in the interview and nobody is going to ask you questions during this time because, “Well, the dude is taking a sip of water. We’re not going to hit him with a question while he’s drinking water”. So, that’s one thing. Another thing you can do is take notes. Get yourself a notebook and write some notes down. You should be taking notes during the interview anyway. Write some notes down about what’s going on and maybe questions or even just some fake notes; just some fake notes will create a pause in the interview. You want to break the continuity of that questioning. So, as soon as you finish an answer maybe, you know, go down and just act like you’re writing a little bit. Of course, they’re not going to ask you questions while you’re writing. That would be rude. So, there’s three things you’ve got. Re-remember all your work experiences, commit those to short term memory. Look at your audience when you’re talking to them, make eye contact. Take sips of water to break the continuity of the interview and take some notes. That’s it. That’s going to put you in a more comfortable level in the interview, a little bit more control, and it’s going to make you more comfortable, it’s going to make you feel more confident and it’s going to put on a better show. You’re going to look better to that panel and they’re going to be more inclined to invite you back to a second interview. Alright, my friend. 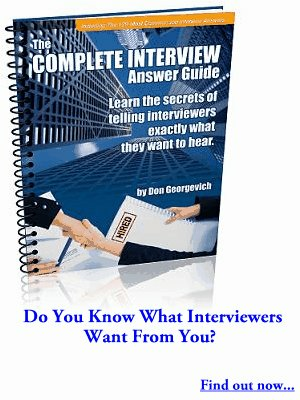 Now, before you go on your next interview, if you don’t already have it, I would strongly suggest grabbing a copy of The Complete Interview Guide. This guide has over 140 different questions and it’s got behavioral questions, it will teach you how to answer questions about why you want to work there, why you left your last job, tell me about yourself, weaknesses, strengths. It’s got a whole bunch of behavioral questions. It’s got everything in the book. This book has been around for over 10 years. You can get it and physical, hard copy, e-book, mp3, video; it comes on all the different formats. It’s one of the best books out there on the market. It’s the one of the longest running books. It’s the most up-to-date book. Something that comes with my book that doesn’t come with anybody else’s book is you can actually e-mail me for help. So, when your own copy of The Complete Interview Answer Guide, you can actually e-mail me for help and I will actually reply to you. So, if you’re stuck on a certain question or you are not sure how to do something, just e-mail me. This book includes 30 days of email support with me; not somebody else, not some college kid somewhere, not somebody who doesn’t know anything. You actually get an opportunity to connect with me directly and I e-mail back everybody usually within a day; sometimes it might take two, but you get that and nobody else does that. I can guarantee if you buy a book on Amazon on questions and answers and you have a question, that author is going to answer your question. That author doesn’t even give you their phone number, they don’t give you their email address, they don’t want to hear from you. They’re just writing the book and they just want you to buy and that’s it. I want you to buy my book because it’s going to help you. It’s going to help you go farther in the process, but I’m also going to be here. I’m also going to be here for you, helping you along the way. So, when you get stuck you’ve got someone to reach out to; you’ve got a friend. You’ve got a friend, someone who’s here for you to help you get unstuck so you can go far the interview process, so you can get the job offer, so you can get that paycheck, and you can live the life that you want to live. Alright, my friend. I wish you the very best on your next interview. Get on, nail that panel interview and I will see you in the next video. Bye now. If you’re ready to ace your next interview, then don’t leave anything to chance. You can’t just show up for a job interview and expect to nail it; you know that. You have to give yourself an advantage. So, if you’d like to learn more from me than this video, then I encourage you to grab a copy of The Complete Interview Answer Guide and prepare yourself to answer interview questions the right way. Inside, you’re getting my 20 years of interviewing and hiring experience and I’ll teach you what you need to say to employers so they want to hire you. So, if it’s been a while since your last job interview or you had an interview today, don’t spend countless hours figuring out the stuff. Instead, let me take you by the hand and show you how right now. When you order your copy from jobinterviewtools.com, you’re supporting my channel, my message and job seekers all over the world, and are getting a book that has already helped over a million people get hired for their number one job. You’ll also get direct e-mail access where you can ask questions and get my personal take on your situation so you’ll never be alone during your job search. And finally, if you found this video helpful, then give it a ‘Thumbs Up’ and make sure you subscribe to my channel so you’ll get notifications every time I release a new video. And by subscribing, you support me, my message and this channel. So, I’d really appreciate it. Make sure you hit ‘Subscribe’.